It didn’t matter a jot that this Autoquest 130 didn’t feature all the latest gismos. We were glad that it was pretty compact (just over six metres long and a little less broad of beam than most modern coachbuilts). Such has always been the appeal of Elddis’ budget-priced range – forget the fripperies and look at the price. For years Elddis have had this market pretty much to themselves. There were Italian rivals but their continental layouts and gaudy fabrics targeted a younger audience. If you wanted an interior with a British flavour, Swifts and Auto-Trails were in a different price league. Not any more. With Tribute and Escape brands respectively, Auto-Trail and Swift are poaching buyers away from the Autoquest range. But look at the photos here and you might struggle to associate the bold upholstery with this once old-fashioned brand. And there’s a big leap forward in build-quality since we last had an Autoquest on test. On the outside, new graphics, Polyplastic windows and 3D logo on the rear are all that mark out the 2011 Autoquest. It’s simple, but actually it looks OK (and it does have a colour-coded front bumper, unlike its rivals). 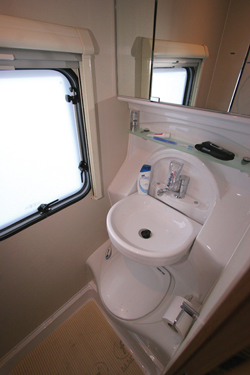 It’s a shame that Elddis persist with such tiny water drain taps. And the water capacities (45 litres each) are below what we’d expect in a modern coachbuilt. At least our test vehicle had an electric step for the door and a useful flyscreen. Both features are included in the Luxe Pack, which adds £999 and also includes the Heki sunroof and blown-air heating. Elddis fail to offer a pack of options on the Peugeot base vehicle, which comes with remote radio controls on the steering wheel but otherwise seems a bit limited in spec. Only the largest Autoquests (155 and 180) are available with anything but the 100bhp HDi engine and five-speed gearbox. Inside, they’ve got the look exactly right. With plenty of light and squishy armrest cushions, this lounge looks – and feels – anything but ‘budget’. 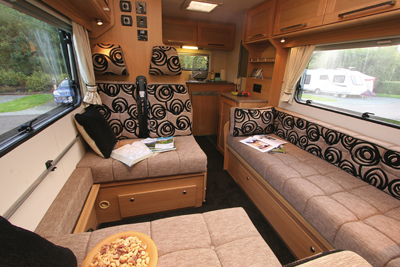 The design compliments the Elddis’ revamped style. You won’t find LEDs in here, but there’s a round ceiling lamp and fluorescent tube directly over the galley. In the daytime, though, the small rear window combines with the unglazed door and opaque roof vent to make the rear quite gloomy, especially in contrast to the daylight flooding into the lounge. 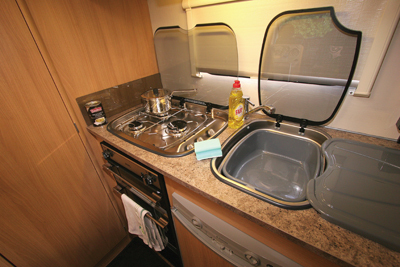 In the kitchen, the Thetford cooker has a grill, oven and three gas rings so there’s nothing ‘economy’ about it, with a stainless steel sink that comes with an inset plastic bowl and removable draining board. Downsides? The Dometic fridge comes with manual push-button ignition for its gas function. You won’t want for storage space, though. Underfloor water tanks free up space inside for storing your gear. And under-seat compartments open up a generous amount of stowage space. Then there’s the wardrobe, which is adequate for a couple. With no big external locker, outdoor chairs will probably end up in the luton, a space that also makes a good bed for one adult or two kids. The downstairs beds are greatly superior in comfort, due to their thicker mattresses, and you can make two singles or turn the offside bed into a double. Squeezed into the offside rear corner and barely deeper than the wardrobe alongside, the washroom is best described as petite. The bench cassette toilet is the modern one with wheeled cassette. Above the cassette is a tip-up basin of surprising solidity and a minuscule mirror-fronted storage unit. The wallpaper-and-white-plastic look seems bare and dated alongside more upmarket ’vans, but the little room works for those who won’t be relying on it all the time. In fact, the washroom is (along with the associated tiny water tanks) is perhaps the Autoquest’s Achilles’ heel. Elsewhere, there’s much to like. 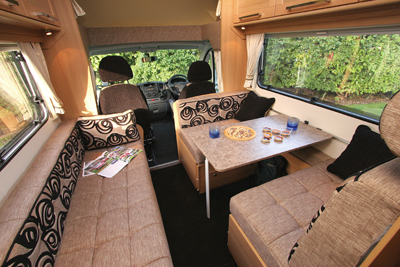 This motorhome has many features that belie its budget price tag such as its comfortable lounge and well equipped kicthen. Only the petite washroom and small watertanks let it down slightly. 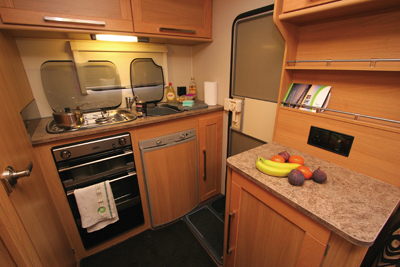 Beds: Overcab bed 2.04m x 1.35m, offside dinette bed 1.86m x 1.23m, nearside settee/single bed 1.81m x 0.67m. 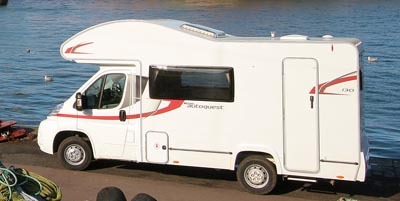 * Motorhome insurance cost based on 2011 Elddis Autoquest valued at £33,294. Fitted with manufacturers immobiliser, kept at home behind 24 hour locked barrier at TD9 8ED. Motorhome owners – professionals over 50 years old with no claims, convictions or health conditions in last 3 years. 4 years no claims bonus mirrored from car policy and 2 years motorhome driving experience. Members of motorhome club doing less than 7000 miles annually. £250 excess applies. European cover £11 extra, European Breakdown £42 extra. Premiums include insurance premium tax at 6% and are correct as of 19.02.11.